Qualquer dúvida ligue para Ken em 651-366-1369. Localizado na Marina de Veneza em deslizamento 41, casa de 2 andares, barcaça é 24 'x 44', 3 quartos, 2 banheiros, dormir 7 + pessoas, lá embaixo tem (2 beliches, cama de casal e 1 cama de solteiro) no andar de cima tem 1 quarto com (cama de casal e beliche no topo) 3 unidades de ac, calor elétrico, cozinha completa, lavadora e secadora, um grande barco pode atracar na varanda da frente, estação de limpeza de peixe, freezer 5 cu ft, máquina de gelo 500 lb, e grelhador a gás. cancelamentos de última hora são permitidas se o tempo estiver ruim. Há US $ 75. 00 TAXA DE LIMPEZA. Excelente guia de pesca costeira está disponível no acampamento ao lado. Eu recomendo ele. Vá para www. VeniceGuideService. com. We went for 10 days for vacation to fish!! We had the best stay and caught a ton of huge fish. The owner was awsome and keep in contact to make sure everything was perfect. We would definitely come back. Trip, not the nicest down there but functional. The downstairs shower is a little sketchy if your taller than 5’. The manager is great to work with. The dock is small it’s difficult for a large offshore boat to get in there but we did it just make sure to let your captain know if you are in a large boat. Overall we enjoyed the place and would go back. We stayed 2 nights at Cody's, nothing fancy but clean and plenty of room for us! Excellent recommendation from owner to hire Venice Guide Service! Great trip to the, will return. We stayed 3 nights and 3 days. We were fishing the mouth of the Mississippi River and this place was a great base. Nice and roomy inside and comfortable for 6 men. The only drawback was it only had one fullsize shower. I have stayed at Cody's Rainbow Reds a number of times and it is always great. The unit is clean, has a nice kitchen and a working big screen TV, cool Air Conditioning, and is reasonably priced. 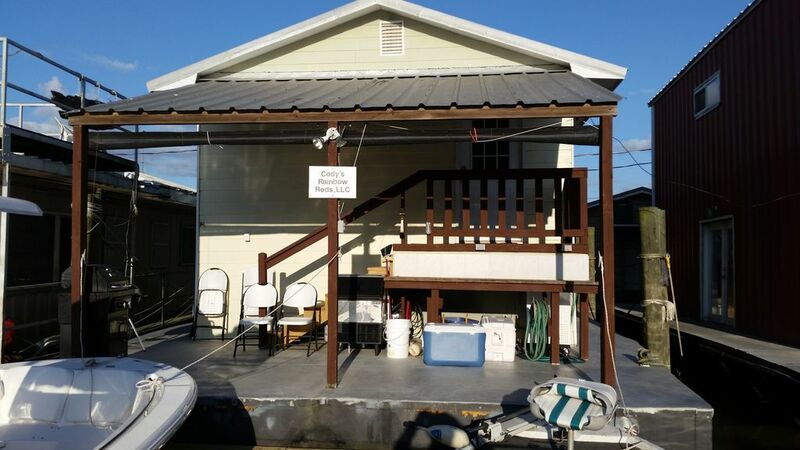 The location is great and only steps from the Venice Marina restaurant and dock. The manager, Ken, is easy to deal with and reasonable. He responds quickly to any questions. I highly recommend Cody's and I will be staying there again in 2019. Contact manager for cancellation policy.